1. I've always been interested in joining a Civil War group. How do I do that? We're excited to hear it! There are two ways to go about joining the 2nd. Go to our "About the Brigade" pages and decide which part of our brigade you would like to be in, and e-mail your impression's specific coordinator. They will e-mail (or snail mail) you our new-members packet, and you will be added to our listserve and closed-group facebook page to receive information and updates about our events. Visit us at one of our events (located on the homepage), and talk to our members to get a feel for what impression works for what you already love. We will assist you right on the field, and help you join up with a follow-up e-mail after the program. Also, check out our recruiting booklet. Yes, there is an annual $35.00 members' fee, called dues, that covers your whole family. You pay your first dues before your first scheduled event. After that, everyone pays their annual dues at our All-hands meeting in January. 3. I have kids who want to join. Is there an age limit? Yes and no. If you are in the Jersey Blues, we don't have an age limit. We do require the child to have a parent or guardian join with them and accompany them to events until they are 16, but children of any age can participate in civilian impressions. If your child wishes to join the infantry or any active-duty role, they must be 12 years of age to be in formation, and 16 years of age to carry a rifle and/or handle any other type of firearms. These age limits are for safety and insurance purposes, and are non-negotiable. 4. I'm a woman, but I want to be involved in the infantry. Is this allowed? Absolutely. Literally hundreds of women historically dressed as men to join the army on both sides. We currently have several women who dress in uniform and portray soldiers, musicians, and artillery staff. 5. What if I'm African American? Am I allowed to join any part of the regiment? Absolutely. We would be delighted to have you in any of our impressions. 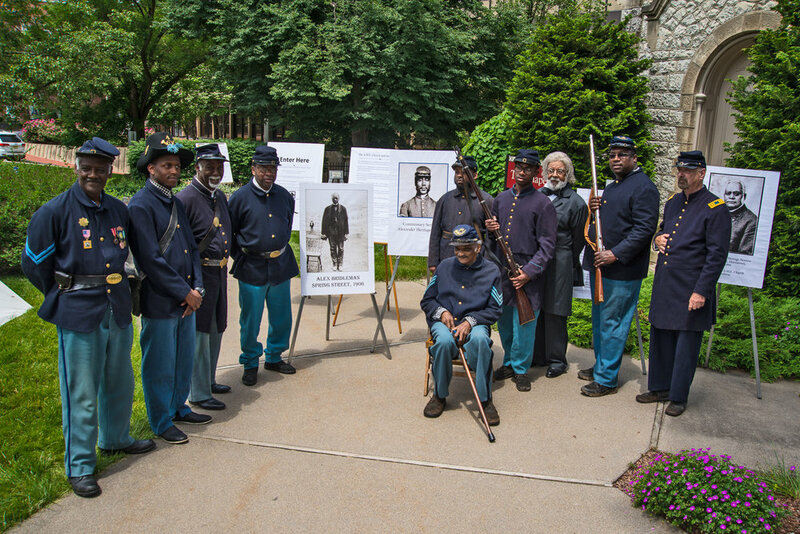 While we do have the 22nd UNCI, which was a historically African American regiment, we encourage you and your family to join and participate in any way you wish. 6. What if I, or my kids, aren't sure we want to join, but we want to try it out? You can absolutely come to one or two of our events and try it out before joining. 7. What if we don't know anything about the Civil War? That's okay. You can learn as you go; most of us do. We encourage you to learn from your fellow reenactors in the field, as well as doing research on your own. Check out our "Links" page to find some sources, and visit your library and local historical societies to get more information about 19th Century social history. Also read our handbook, which will provide you with a ton of information right off the bat. 8. What if the public asks me a question I don't know the answer to while I'm still researching? It's absolutely appropriate to say "I'm not sure about that," or "I don't know the answer to that." Most of us aren't walking encyclopedias, and we have a focus or interest. Feel free to refer the visitor to someone else in the camp who may be able to better answer their questions. 9. Do I have to be an actor and impersonate a historical person? No. Most of us do what is called "3rd person interpretation." This means you stay your 21st Century self, but you wear period correct clothing and talk to the public about the different aspects of history in your particular interest. You can certainly focus on a particular real-life historical figure if you choose, but it's absolutely appropriate to talk about the history in a general manner. 10. I don't have a historic outfit, can i still come to events? Yes. Once you officially join, contact your impression coordinator and let them know what uniform parts you're missing. They will help you find other members who have clothing and accessories that you can borrow until you buy your own. 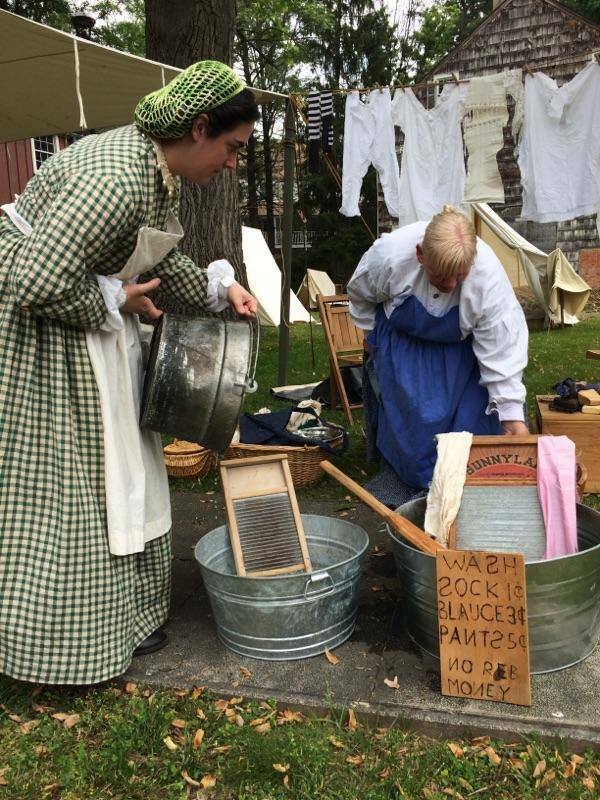 If you are joining the Jersey Blues, Mrs. Belcastro has a variety of historical outfits that new members can borrow for both women and children. E-mail her before the event you wish to go to, and she will make sure you and your children have correctly sized outfits for the event. 11. Where do I buy all this historic stuff? Most of us order our things online from reputable sutlers or reproduction companies, or we make what we can on our own. Check out our links page for a list of our favorite sutlers and online companies. If you're looking at making some things yourself, talk to some of our members during events to get some tips on how to make things on a budget. We also tend to buy and sell from each other, so ask around at an event to see if anyone is getting rid of equipment or clothing. 12. How expensive is all the equipment and clothing? Unfortunately, clothing and supplies are very expensive since much of it is made by hand or in small quantities. However, deals for uniform parts can be found on E-bay, or by making trades with other reenactors. Supplies can often be found at garage sales or antique shops if you have the time to look. Due to the expense, we understand that it takes a long time to put together your impression, and we will always strive to share our equipment in the meantime. 13. Do I have to go to all the events? We only ask that you come to 3 events a year to stay an active member. We understand that this is a hobby, and that life and work often take precedence. Your impression coordinator will let you know which events we need greater attendance for; at which point, we encourage you to attend those events first. 14. I don't own camping equipment. Do I have to camp? No. If an event is close to your home, or you would prefer to stay at a hotel, you are absolutely allowed to do so. 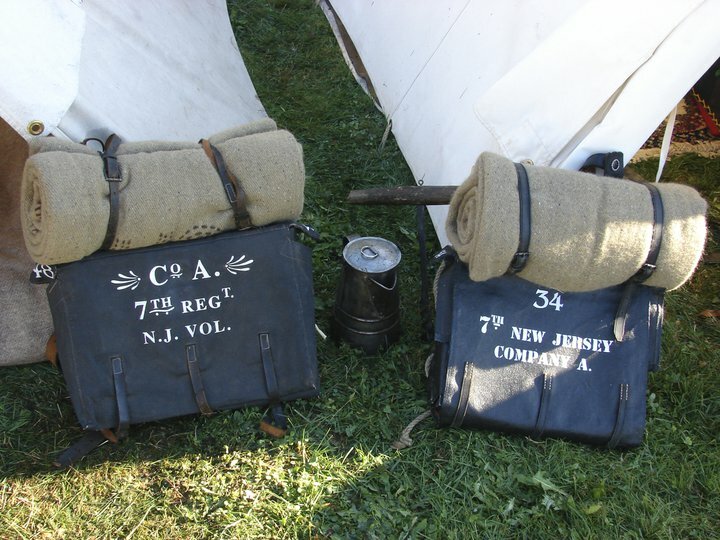 However, much of the fun for reenactors is camping out and enjoying one another's company after the public leaves, so we encourage you to try the camping aspect if possible. 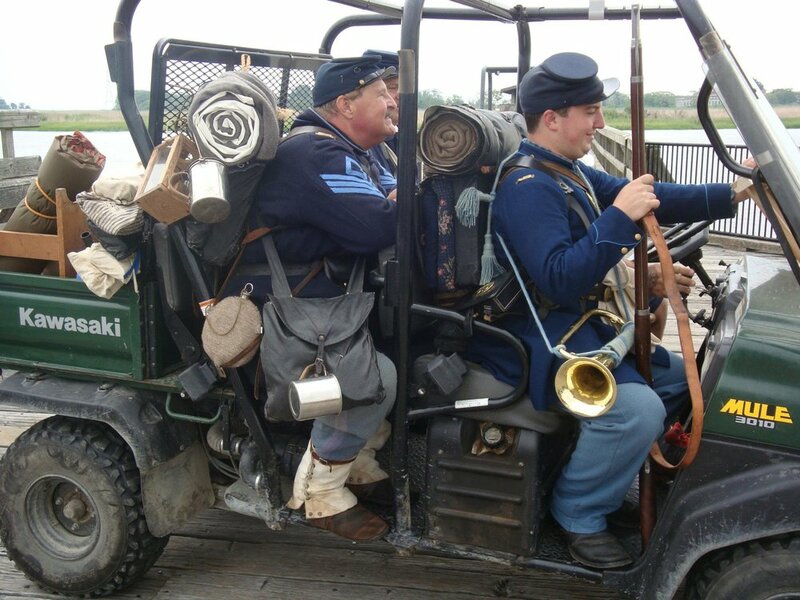 Reenactors are incredibly giving people, and have no problem sharing their tent, or allowing you to borrow equipment until you can buy your own. 15. What should I realistically be looking to get out of this hobby? Fun. This hobby should be fun. 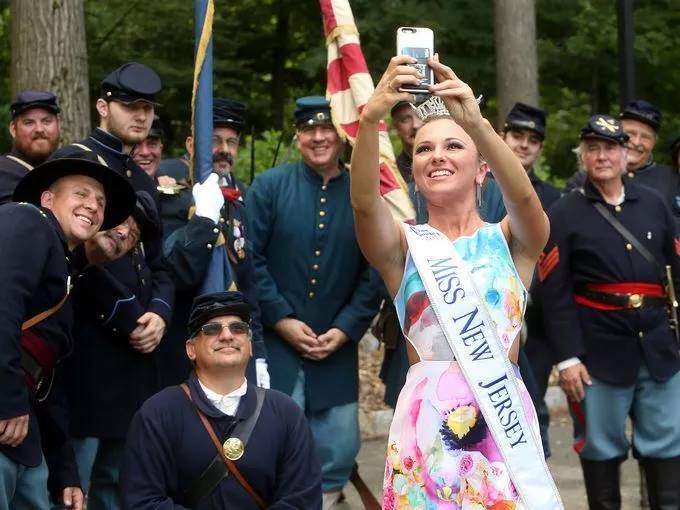 Yes, it's about history, and yes our mission is to educate the public about the many important facets of the American Civil War, but at the end of the day, you should be having fun while you're doing it. Build friendships, continue learning, and enjoy sitting around a camp fire at night surrounded by a bygone era brought back to life.